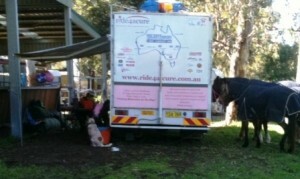 We’re camped at Claremont in Perth at the riding for the disabled facility with a fantastic one acre paddock for our horses. 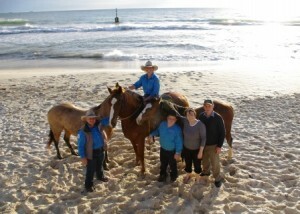 Two of my sisters and one of Esther’s cousins had flown from Armidale in New England and also Melbourne to witness Esther’s arrival at Cottlesloe Beach after 97 days on the road riding 3 horses across four states of Australia. We found out late on Friday that Assoc. Prof. Grant McArthur who heads the Hannah Rose Melanoma Research Fund is in Perth for a meeting and was able to briefly catch up with us prior to his flight back to Melbourne. This was fantastic for us, Grant has been such a fantastic support with each of the ride4acure treks and very interested in both the awareness and educational work we do with melanoma and young people and also the fundraising to support his work to find a cure for melanoma. Meeting up with Grant was really significant for us as it is to support his work and his research crew at PeterMac to find a cure that was the catalyst for ride4acure two years ago stemming from Hannah’s hope to support his work. 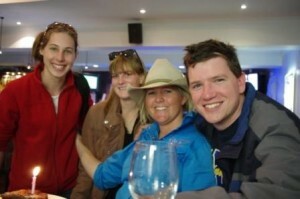 Grant McArthur with ride4acure crew-Grant takes a liking to Joe's Hat! To know how much the efforts of ride4acure mean to the research staff inspires us constantly to do more. Our little mascot ‘Hotondo Hugo’ was the star with Channel 9 reporters when he wanted to have his say about the Coast2Coast trek. Hotondo Homes make a donation each time Hugo makes an appearance with ride4acure on facebook and our website. Channell 9 TV interviewed Esther at the beginning of the Perth CBD leg of the trek before setting off on the 14km ride through the city to Cottlesloe. Ozwest Pilot vehicles generously donated their resources to support our ride to Cottlesloe making a seamless ride for Esther with no traffic hassles. Mark Button (a truckie we met on the Nullarbor) from Berty Button transport company http://bertybutton.com.au/ set up this support for us with the pilot vehicles. ‘Titan’ behaved amazingly well having to go under overpasses on the motorway, under footbridges, over bridges to get to Cottlesloe. About two kilometres from the beach I unloaded both ‘Meg’ and ‘Surprise’ and Esther lead them both with her to the finale. As I drove through these last kilometres with Joe beside me in the truck and Esther riding her horses my heart was huge with pride, respect and love for my kids and our horses. Working together we’ve achieved something incredible that’s very much grown out of our deep love for Hannah and her loss. Something so positive has emerged and is connected to ten’s of thousands of people both in Australia and overseas the ride4acure story is sending out threads around the world. Again I want to give a huge shout out to all our sponsors who have worked with us to make this ride a success. David and Roslyn Wallis from Manuka Chaff http://www.manukachaff.com.au/ flew from Quirindi (near Tamworth) in NSW to be here to witness Esther’s and the ride4acure Coast2Coast Trek finale. David & Roslyn Wallis from Manuka Chaff Quirindi NSW at Finale make presentation to ride4acure crew at Cottlesloe. 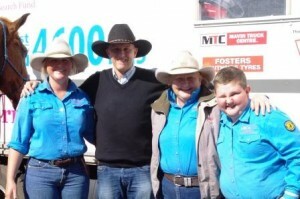 It was awesome to have David and Roslyn with us…we were very conscious also of our other major sponsors from Mitavite http://www.mitavite.com.au/mitavite06/default.asp and Clarke Horseshoes from Wingham http://www.clarkehorseshoes.com.au/. these three companies have all gone beyond our expectations offering support that significantly contributed to our success and we are so thankful for their support. We couldn’t not have done this without their help. 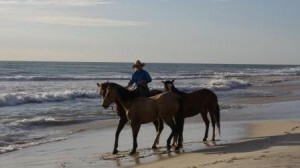 Additionally we’d like to thank HorseTalk TV http://www.horsetalktv.com.au/ for their support in documenting the Coast2Coast Trek, they will be posting webisodes of the trek and later in the year there will be an episode of HorseTalk covering the ride. Film crew seen here joining in with singing Happy Birthday to Eshter. Amazingly the day went smoothly, on arrival at the beach we closed the trek with a ‘Safe Arrival Blessing’ which was facilitated generously by David Tehl, a friend of Fr Chris Chaplin MSC (who lead us through a Blessing of the Horse Trek with a reading of the Travellers Prayer at Crescent Head/Pacific Ocean on 2.5.11 on Day 1). At the conclusion of the Safe Arrival Blessing Joe gathered water and sand from the Indian Ocean and we mixed it with the water and sand gathered on Day 1 at Crescent Head NSW, we’d carried with us for 97 days across Australia- I mixed both waters and sands representing this Coast2Coast Horse Trek journey to ‘put melanoma on the map’ and spread the word across our country from East to West that melanoma is everybody’s business and particularly young people. 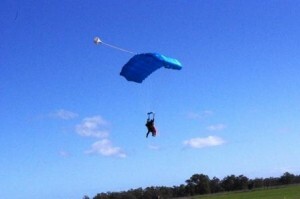 Esther skydiving 21st Birthday Pressie. Our Hero! 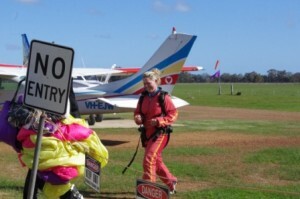 Esther back on the ground after skydiving. 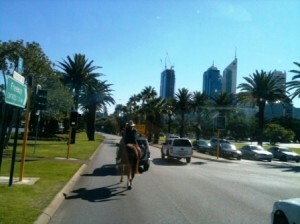 This entry was posted on Monday, August 8th, 2011 at 7:50 am	and is filed under General. You can follow any responses to this entry through the RSS 2.0 feed. You can leave a response, or trackback from your own site. Thats so beautiful Maus Esther and Joe. Made me cry. Ahh girls you made me cry again!!! 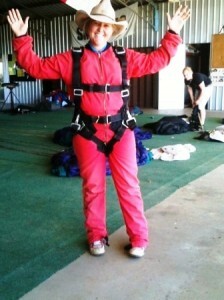 I’m sure you ahd an amazing birthday and that Hannah was up there with you. Your whole family is an incredible inspiration and I’m going to nominate you for family of the year.You have my vote! You are all such an inspiration to life , And yer im crying to after reading your last blog . Deff Family of the year . So glad to Know you guys ..
CONGRATULATIONS! and Happy Birthday too. Esther I am very proud of you and the whole team. You couldn’t have done it without everyone who rode with you and supported you at every pit stop. That walk on the beach must have been sublime.